Independent Pentecostal, Renewal, and Charismatic* churches and fellowship groups may join The Coalition of Spirit-filled Churches (CSC) and have their church represented to the Pentagon, VA Chaplains Service, Federal Bureau of Prisons Chaplaincy, as well as to civilian chaplaincy organizations and institutions. By joining the CSC, not only are the church's members "recognized," but the church may submit names of their qualified clergy to be considered for chaplaincy positions within the military and civilian pastoral care communities. Through the CSC, qualified Spirit-filled men and women are credentialed to be chaplains or pastoral counselors. How can you assist the Lord in His calling Spirit-filled chaplains? Pray for us and for the chaplains whom God is calling and preparing, as well as those who are already serving. 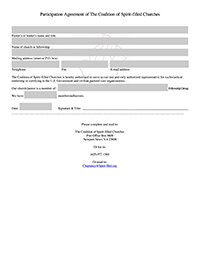 Sign the form (which you can download below and print out), showing your church's desire to be represented exclusively by the CSC. In the proper blank, please indicate the total number of all US citizens (infants to adults) who receive ministry from your church. Please help contact and inform other independent Spirit-filled churches and fellowships who may not yet be aware of this opportunity. Contribute financial assistance as the Lord leads. The CSC is dependent upon the support of its chaplains, friends, as well as member churches and fellowships. The CSC does not receive financial support from the government. Churches who join the CSC may recommend chaplain prospects to the home office. The CSC will then process their endorsements and assist in their accessioning by the military or civilian institutions. As the number of Spirit-filled Americans grows, military and civilian institutions and chaplaincy organizations are becoming aware of the need for Spirit-filled civilian chaplains. There is no better place for fully qualified, trained Spirit-filled chaplains to reach the lost, hopeless, hurting, and dying of society than in our country's many facilities and institutions. You are a vital part of making this mission possible. Please help us meet this need! *Some of our churches and chaplains would state it even more simply: “God is STILL active and intervening in marvelous ways, in the affairs of humanity.” If your congregation or network believes that, you are welcome with us! Come and join! PLEASE JOIN THE CSC TODAY AND MAKE A DIFFERENCE FOR OUR COUNTRY!